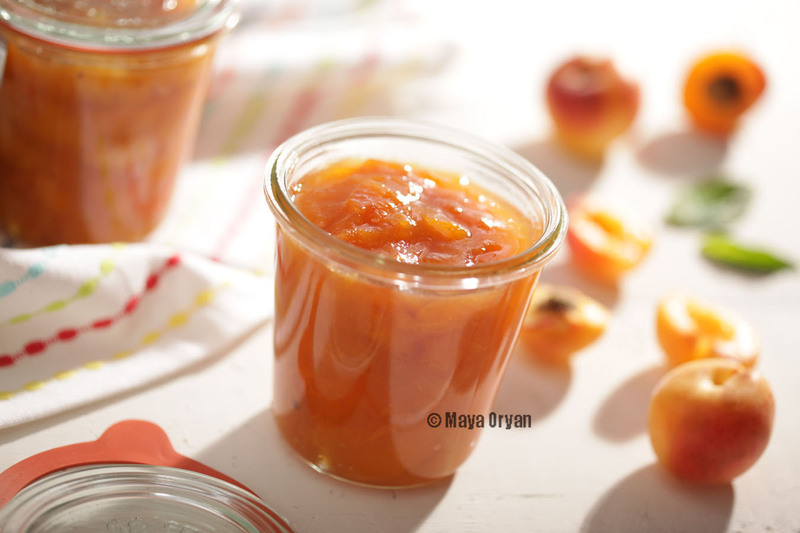 Any traditional apricot jam recipe uses at least 600g to 900g of sugar for each kilo of fruits. I never use this much especially if the apricots are ripe and sweets. Also because I always make a little quantity to consume within the next couple of weeks. I learnt that French warm the sugar in the oven for 7-10 minutes and throw it warm on the fruits; you may want to try that. Most of the recipes uses 1 teaspoon of lemon juice, so feel free to add it if you like. Some housewives crush few pits and add the kernel inside to the confiture while boiling. Remember, to make a good jam, use nice firm ripe fruits and not green or overripe fruits. Preparation Place the apricots in a big salad bowl and cover with sugar. Let it rest for 7-10 hours, preferably in the fridge if the weather is hot. In a heavy based saucepan transfer the apricots and bring to boil for 10mn. Reduce the heat to low and remove any scum from the surface. Let it simmer for about 25mn or until a small amount of the juice gels on a chilled plate. Ladle carefully in jars and keep refrigerated. Consume within 3 weeks.